Brief Description: Do you know the difference between a Hurricane and a Tornado? Well, that might be an easy one for ardent snooker fans (and, of course, meteorologists! 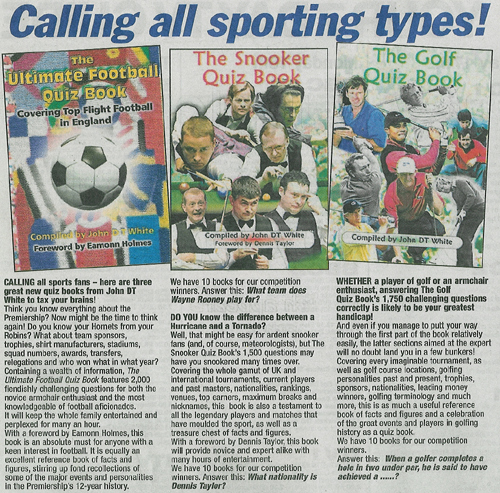 ), but this quiz book’s 1,500 questions, the latter section aimed at the most knowledgeable of experts, is guaranteed to have you snookered many times over. 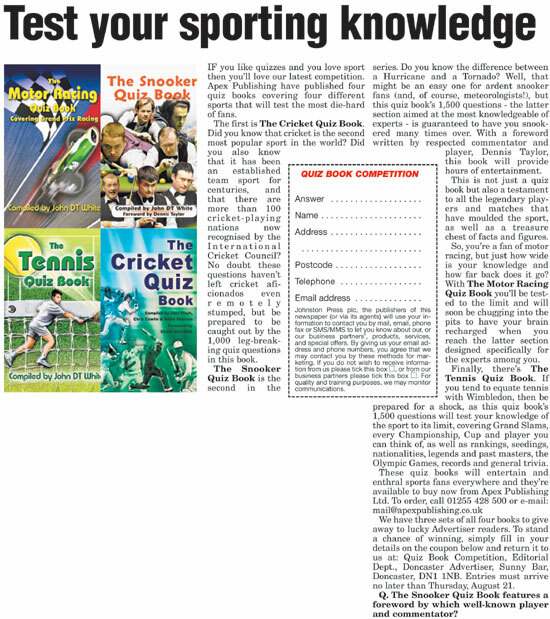 Covering the whole gamut of UK and international tournaments, current players and past masters, nationalities, rankings, venues, top earners, maximum breaks and nicknames, this is not just a quiz book but also a testament to all the legendary players and matches that have moulded the sport, as well as a treasure chest of facts and figures. 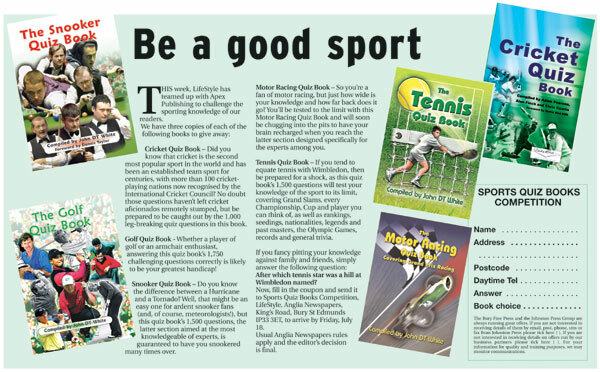 With a Foreword celebrating the sport written by world-renowned and respected commentator and player, Dennis Taylor, this book will provide novice and expert alike with many hours of entertainment, no doubt interspersed with frequent head-scratching and shouts of “Give us a cue”! 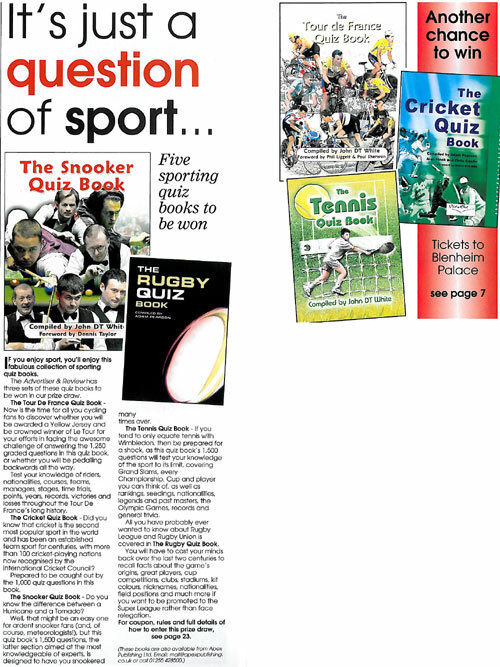 A superb collection of quiz questions devoted to snooker. Everyone I know has been a snooker fan at one time or another and you can answer a surprising number of them even if you don’t consider yourself an aficionado. Well done John. 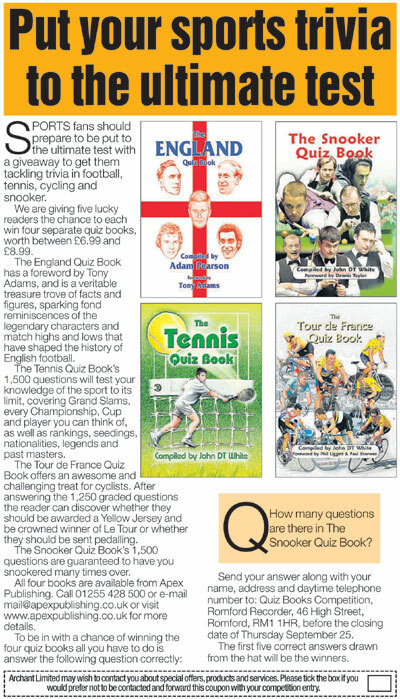 It is with great delight that I write the Foreword to John’s “Snooker Quiz Book”. I have many fond memories from the time I became a Professional Snooker Player in 1972 and I am pleased to see that John has managed to capture so many of them in a quizzical way. Was it really 32 years ago that I turned Professional? There have also been many wonderful Snooker Players throughout the history of our sport. Legends such as Joe Davis, Fred Davis, John Pulman, Ray Reardon, Steve Davis and Stephen Hendry have all graced the green baize with their own dominant style of play. And who can forget the greatest player never to have won the World Championship, Jimmy White. Added to the latter we have today’s players who all seem to possess so much creativity and genius, not least of all, our current World Professional Snooker Champion, Ronnie O’Sullivan. Ronnie just seems to be getting stronger and I honestly think he is capable of winning several more World Titles provided he can retain his enthusiasm and stay focused. Indeed, looking around the Professional Tour circuit today we can see world class players from all corners of the globe. Snooker, perhaps now more so than when I first turned Professional, is truly a global sport with millions of television viewers being able to beam competitions from all over the world into the comfort of their own living room. Snooker, like Football, is a sport full of dreams because any player can beat a fellow Professional, as we have seen all too many times over the years, on their day. If only I could turn back time to have a wager on Terry Griffiths being crowned World Professional Snooker Champion in 1979 or a wee bet on a relative unknown by the name of Joe Johnson creating perhaps the biggest upset the sport has ever witnessed when he beat Steve Davis to be crowned World Champion in 1986. Mind you I don’t think there were too many pundits that fancied my chances of winning the World Professional Snooker Championship in 1985, but I did it. 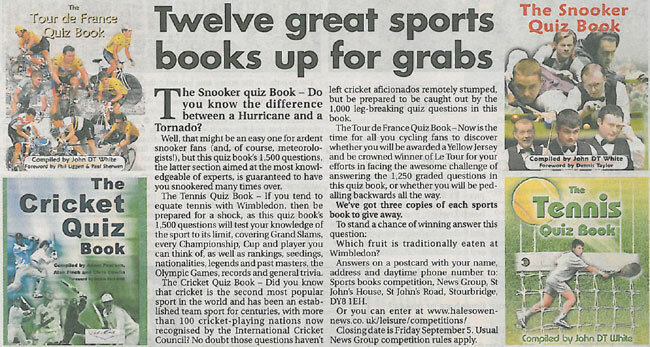 So I really do hope you enjoy John’s “Snooker Quiz Book” as much as I did. Reading it tested my own memory of Tournaments over the years. Thank you John for bringing back may wonderful memories of a sport that has provided me with so much happiness and joy in my life, as a Player and as a Commentator. Long may the game of Snooker continue to thrill us all. Well it is about time we had a Sports Quiz Book devoted entirely to Snooker and I see my old mate, Dennis Taylor, wrote the Foreword to it. I really enjoyed John’s Book and it is so well laid out, section by section, topic by topic covering all of the major tournaments and players. 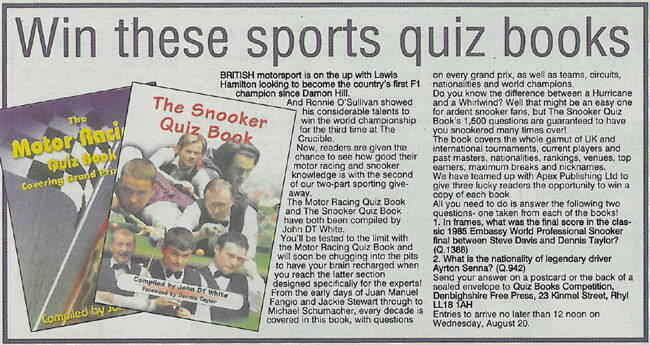 I can thoroughly recommend this Snooker Quiz Book to all fans of the sport out there. 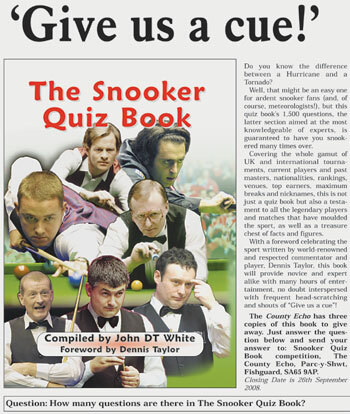 This is the ultimate snooker quiz book. Whether you are a snooker nut, or just have a passing interest, this book promises to challenge and entertain you. 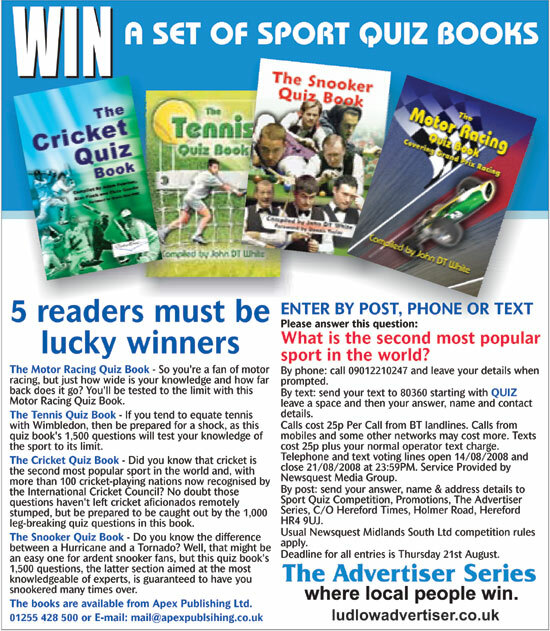 It has a full array of questions, from general snooker knowledge to in depth facts and figures. A thoroughly enjoyable read. Do you know the difference between a Hurricane and a whirlwind? Quite an easy quiz question for all snooker fans and I guess the odd meteorologist unless of course you happen to be Michael Fish! Yes Michael a hurricane was coming! 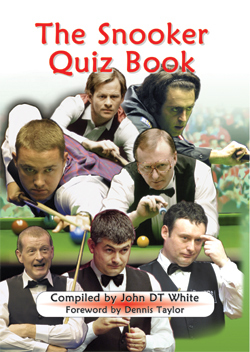 The Snooker Quiz Book compiled by White, that’s John DT White and not Jimmy of the once lightening cue, has more than 200 pages of snooker quiz questions and answers. This is one of a series that John has produced and will interest followers of the game as well as the plethora of quiz master in the Gourock area. The foreword by Dennis Taylor, the 1985 world Champion sets the tone and is super value. Questions about Scottish champions Stephen Hendry, John Higgins from Wishaw and many more will keep you scratching your head for hours. Mind you, no shouting out “Give us a cue” when the quiz master asks a hard one! Containing more than 1,500 questions on snooker, its personalities and competitions plus of course the answers this is a cracking book for any bloke to pull out of his stocking this Christmas. Pop down to you local book shop and order it from Father Christmas. 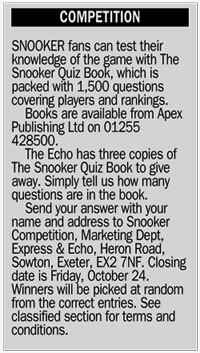 * The Snooker Quiz Book, compiled by John DT White, foreword by Dennis Taylor is published by Apex at just £7.99 ISBN 1-904444-27-X. I thoroughly enjoyed the book and will continue to do so, as this is the sort of book you will return to time after time, for countless hours of fun. This is a delightful book, a testimony to the author's countless hours of research. 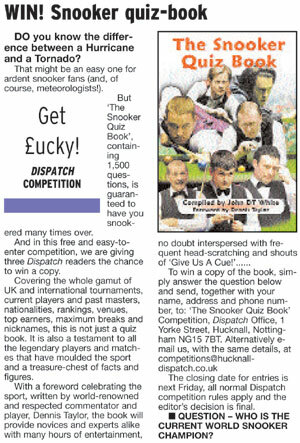 A must for every snooker fan, with something for everyone within its cover. 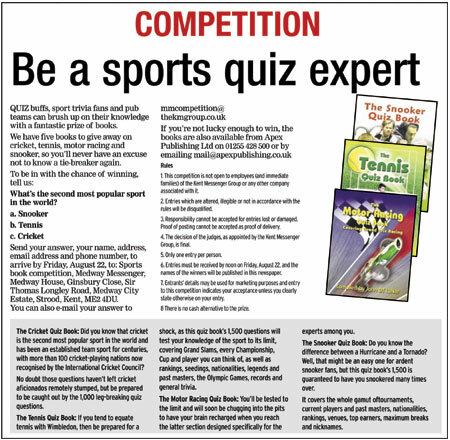 This is one of a series that John has produced and will interest followers of the game as well as the plethora of quiz master in the Hartlepool area. Here is your chance to get your hands on a copy to stop all that head scratching. The Mail are offering a copy to the first correct answer to be received to this question - and no shouting “Give us a cue”! Who did Dennis Taylor beat in the final to win the 1985 Embassy World Championship? You have to be in it to win it and if you are not the lucky winner well pop down to you local book shop and order it from Father Christmas. SO, you think you know your sport? Well, we have two books to give away which tell you if you are right. One is the Snooker Quiz Book and the other the Golf Quiz Book both compiled by John DT White and published by Apex Publishing Ltd. There are 1750 questions in the Golf book with every subject under the sun covered from the history of the US Masters to the location of courses all around the world. There are also special sections on a number of great players who have graced the greens over the years including our own Darren Clarke, Seve Ballesteros, Gary Player, Nick Faldo, Jack Nicklaus and Greg Norman. The Snooker Quiz Book is equally as compelling with former World Champion Dennis Taylor writing the foreword. There are 1500 questions in this one with topics such as the World Championships and tournament venues sure to interest green balze fans. 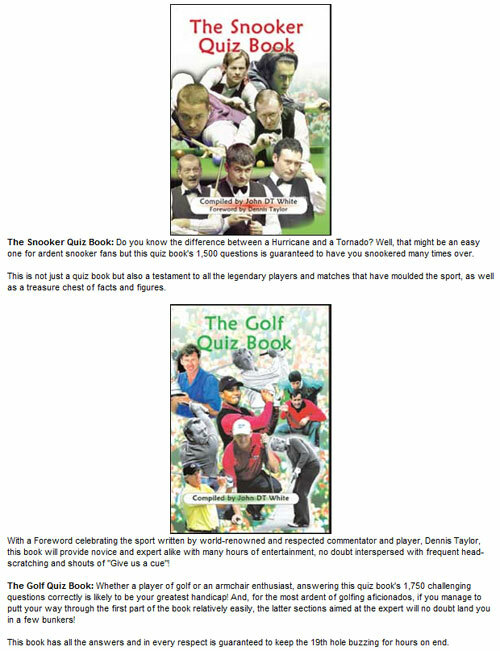 In keeping with the theme of the golf book, there are individual sections on players like Steve Davis, Ronnie O’Sullivan, Ken Doherty, Jimmy White, Alex Higgins and Kirk Stevens. Both publications are £7.99 in the shops but we have three copies of each to give away in a special Belfast Telegraph competition. WHAT HAVE Anne Robinson, Magnus Magnusson and John DT White have in common? They all have the capacity for taxing the grey matter with their questions. And given Britain’s penchant for pub quizzes and trivia then JW’s new book should be a winner. 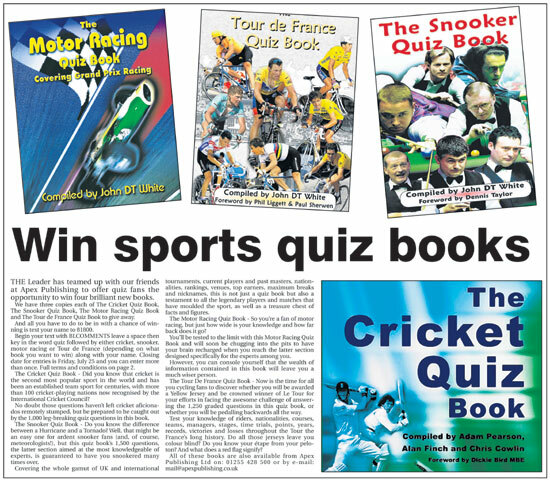 It’s the first quiz book offering, as far as CueSport is aware, solely dedicated to snooker. But if you’re a fan of the green baize then it’s a must purchase. Indeed, you can keep yourself amused when the action on the table gets a little slow. The book covers every conceivable snooker from questions on last year’s Embassy World Championship to a section on Fred Davis. It’s available from Apex Publishing Ltd, PO Box 7086, Clacton on Sea, Essex, CO15 5WN. 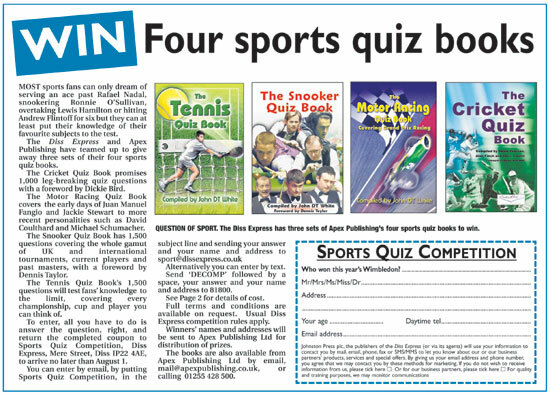 Alternatively, you can order through CueSport at 3 Church Meadow, Greenfield, Oldham. It costs £7.99 and very good value. Here are three teasers to give you a flavour of the book. 1. In which year did Ronnie O’Sullivan win his first Embassy World Title? 2. Name the player to appear in four consecutive Benson and Hedges Masters finals? 3. Who along with John Parrott and Stephen Lee made up the England team at the 2000-2001 Nations Cup? We will give you the answers next month. Or you could buy the book! 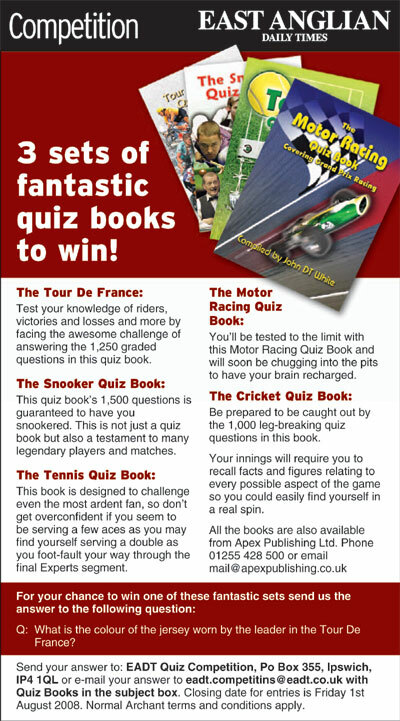 “The Snooker Quiz Book” (Apex Publishing) by John White is an exhaustive test of knowledge featuring 1,500 questions about Snooker, its players, tournaments and results. Categories include specific events, the Embassy World Championship for example, and both past and present professionals. The anorak needs to be donned in order to answer many of these questions. With so much information, the odd mistake is inevitable but, on the whole, this book provides an avalanche of trivia that will keep devotees of the game going for hours. Compiled by John DT White and foreword by Dennis Taylor. A comprehensive test of knowledge for any Snooker fan. The book for the snooker collectors’ shelf! It's a must for Snooker lovers, a book with it's own personality. A compelling read. Easy access to facts old and new - excellent!